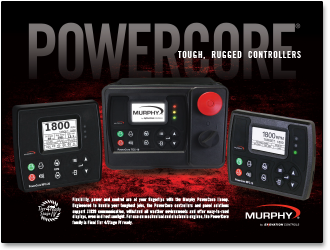 The Murphy PowerCore® 10 Controller (MPC-10) is a general, all-purpose manual/auto start and manual/auto throttling engine controller designed with rental applications in mind. 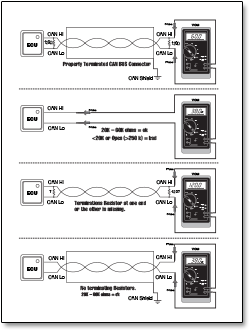 The controller is purposed primarily for applications where a wide array of inputs and outputs are not required. 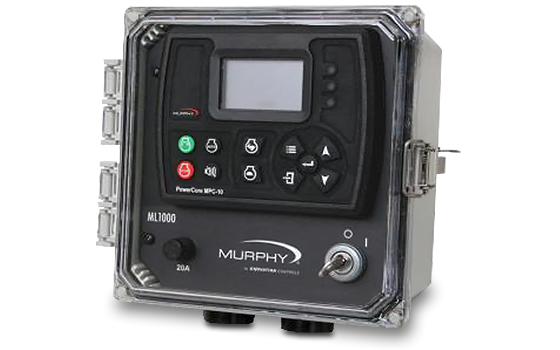 This is a powerful and rugged controller that supports J1939 CAN protocols for electronically governed engines as well as analog sensors on mechanical engines for fault and safety shutdowns. While reprogrammable, the MPC-10 follows a standard operating sequence. This operating sequence is a set of 22 machine states that happen in a predetermined order. Machine states can be set to zero if not needed or adjusted to fit the application. The menu structure is incredibly versatile, with the ability to change many parameters and settings from the face without the need of a PC tool, if desired. 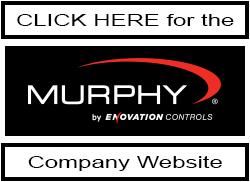 The MurphyLink® Series ML1000-4X Panel, engineered and built by Enovation Controls’ Industrial Panel Division, is a superior panel offering which includes the powerful, yet simple-to-configure MPC-10 Controller. 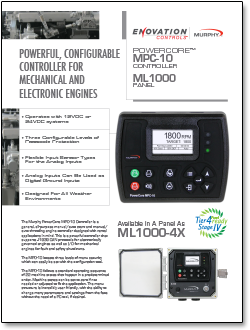 The MPC-10 is a general, all-purpose manual/auto start and manual/auto throttling engine controller designed with rental applications in mind. The controller is purposed primarily for applications where a wide array of inputs and outputs are not required. 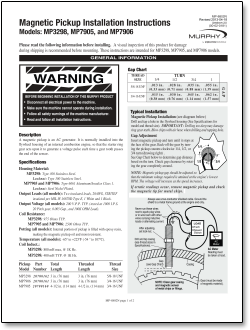 The MPC-10 supports J1939 CAN protocols for electronically governed engines as well as analog sensors on mechanical engines for fault and safety shutdowns. The MPC-10 follows a standard operating sequence of 22 machine states that happen in a predetermined order. Machine states can be set to zero if not needed or adjusted to fit the application. The menu structure is incredibly versatile, with the ability to change many parameters and settings from the face without the need of a PC tool, if desired. 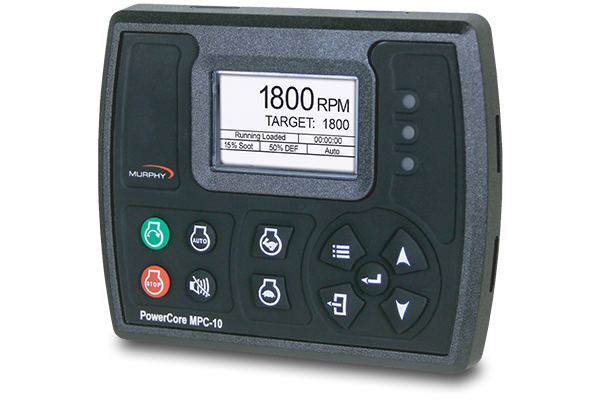 The flexibility of the MPC-10 controller allows for the same control panel to be used across many applications. 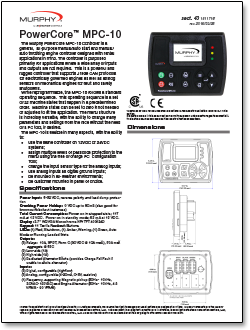 This provides the operator familiarity with the controller and control panel in any application. 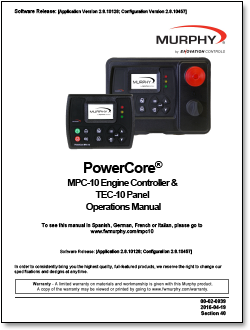 The Control Panel utilizes industry-standard Deutsch connectors and is compatible for use on the simplest mechanical engine to the most advanced, fully electronic Tier 4 engines, when used with the correct Murphy Industrial Harness (MIH) or John Deere OEM engine harnessing. A free-of-charge PC Configuration tool is available to allow customers to change default settings and provide three levels of passcode protection. 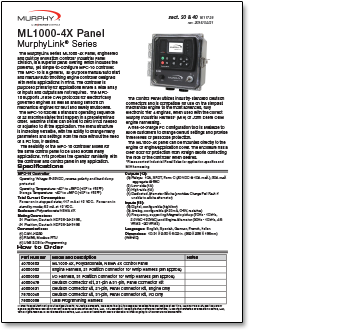 The ML1000-4X panel can be mounted directly to the engine or engine/application cover. The enclosure has a clear door for protection from foreign debris contacting the face of the controller when desired. 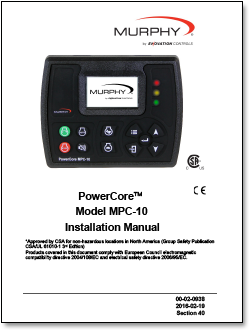 Click here to purchase the PowerCore® MPC-10 in the MurCal web store.